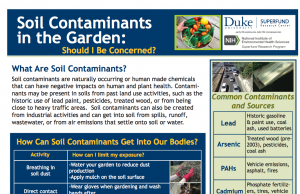 This website, a project of the Community Engagement Core of the Duke University Superfund Research Center, provides information and resources for community gardeners in North Carolina on the sources and health impacts of soil contaminants and pesticides, simple ways to reduce your exposure, and how to get your soil tested for contaminants. 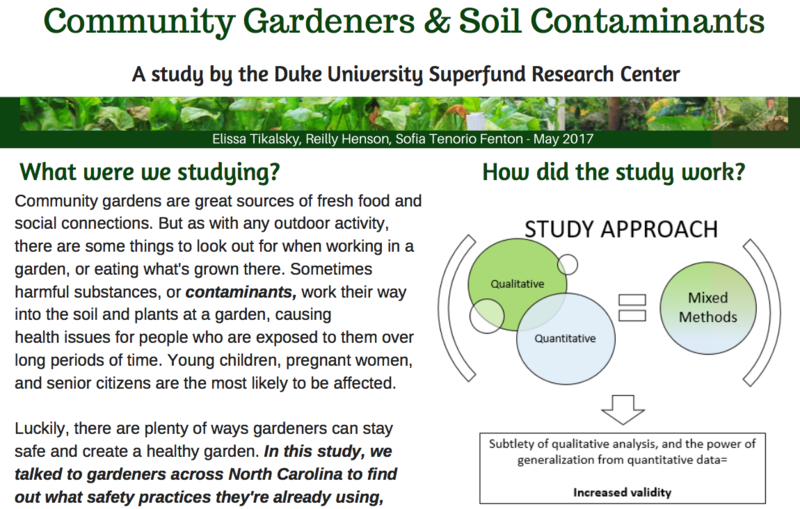 The Duke Superfund Research Center (DUSRC) Community Engagement Core is undertaking a five-year project in partnership with gardening organizations in North Carolina to facilitate education and awareness about the issue of soil contaminants in community gardens, and to promote safe behaviors to reduce exposure, especially for populations that might be at risk of developmental effects early in the life stage (like children and mothers). We will also work with a few selected gardens to create an action plan for managing and/or cleaning up contamination. 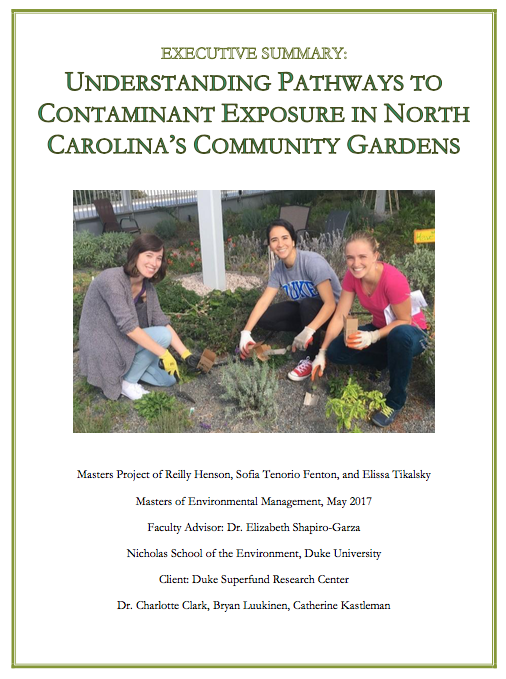 In 2016-2017, the Community Engagement Core conducted a pilot project in collaboration with three graduate students from the Nicholas School of the Environment at Duke University to determine the state of soil contamination in North Carolina community gardens. 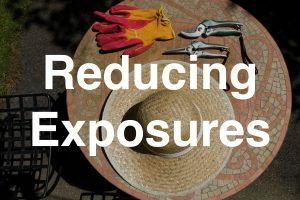 Specifically, the pilot project explored how well community gardeners currently understand this issue and employ practices that reduce exposure, as well as the barriers and motivations to reducing contamination and exposure through behavior change. 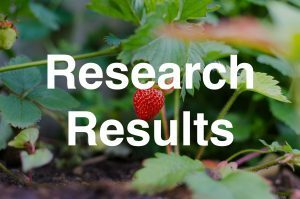 Methods of data collection included working through partner networks, such as the North Carolina Community Garden Partners and the North Carolina Cooperative Extension, to distribute a statewide survey by email, followed by in-person interviews, focus groups, and site visits at six gardens across North Carolina. The results from the initial phases of the pilot project will inform a five-year effort in collaboration with gardeners to encourage education, awareness, and safer gardening practices in order to reduce or prevent exposure to contaminants in garden soils. 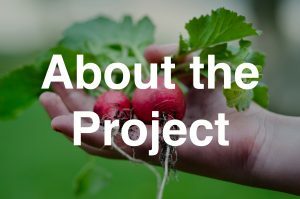 In the next phase, we will work with ten gardens in North Carolina to sample garden soils, and then select 3-4 of these gardens to work with closely and create an action and contamination management plan. 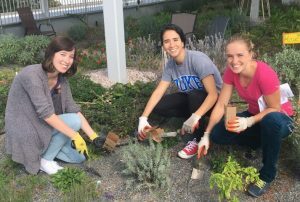 Students from the Nicholas School of the Environment’s Master of Environmental Management (MEM) program (L-R) Reilly Henson, Sofia Tenorio Fenton, and Elissa Tikalsky who helped to gather and analyze data for the gardens project in 2016-2017. We observed a few common themes in the gardens we studied for the pilot project. 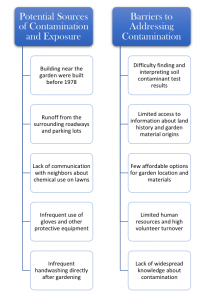 This graphic illustrates some of the most common potential sources of contamination and exposure among the gardens in the study so far, as well as the most frequently cited barriers to addressing soil contamination issues. 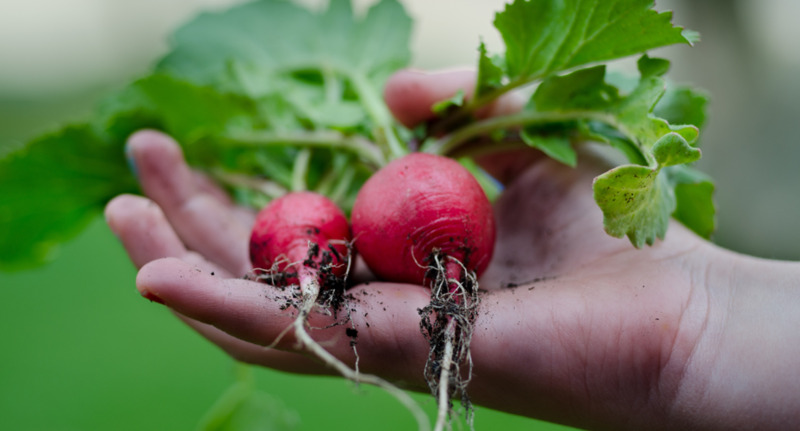 Some of them may be correlated with increased possibility of contamination, although the only way to confirm whether your garden is contaminated or not is to complete a soil contaminant test. For a more detailed description of our current results, you can read the complete Executive Summary from the pilot phase of the project by clicking here. 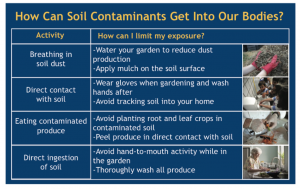 Where Does Soil Contamination Come From? 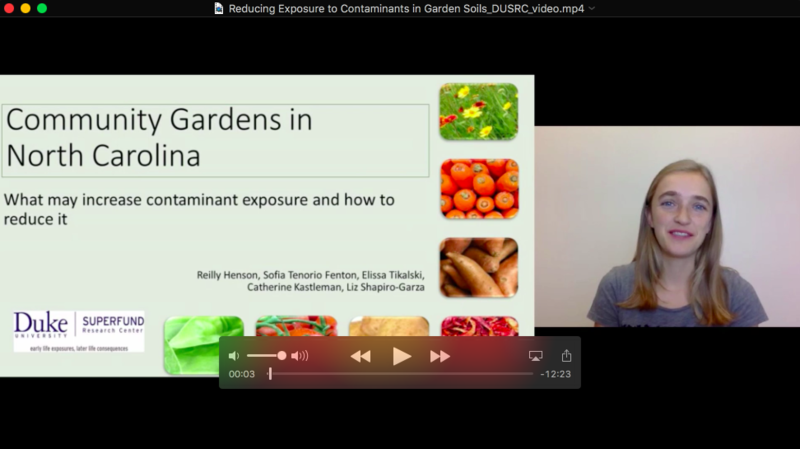 Contaminants come into the garden from a variety of sources including former land uses on the property, surrounding human activity, and choices about what people bring into the garden themselves. 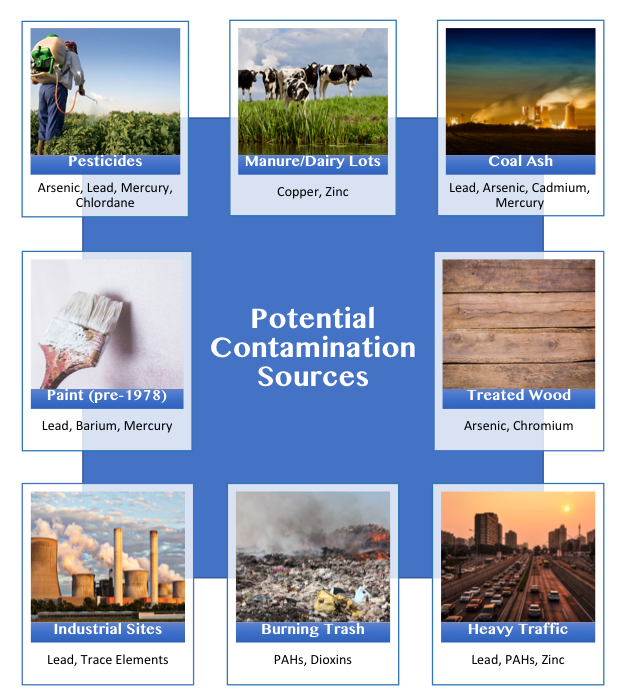 Below is a graphic showing a few potential sources of contaminants in soils. 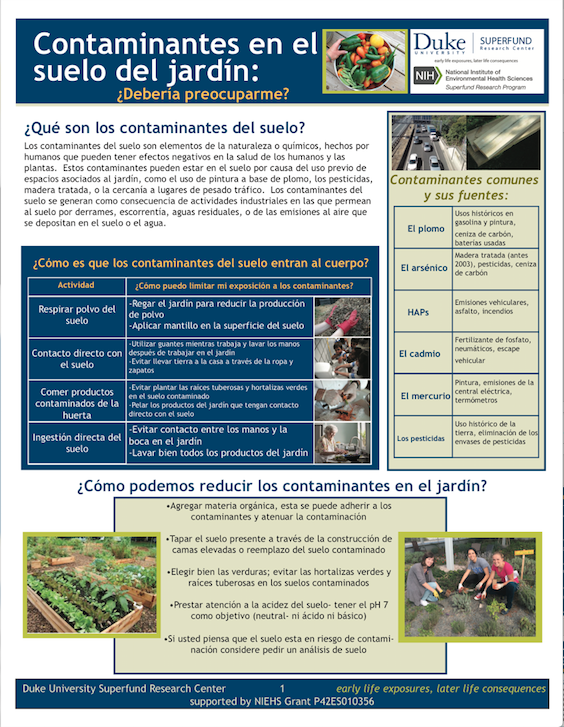 Want to know what potential contaminant sources are around your garden? The Research Translation Core and Community Engagement Core have created GIS maps of North Carolina Community Garden Partners’ garden sites as of 2016 with layers showing various potential sources of contamination using data from EPA’s EJSCREEN and C-FERST environmental justice (EJ) exposure mapping tools as well as state databases. 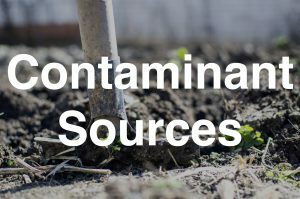 The mapping tool to explore potential sources of contamination near community garden sites is available at https://sites.nicholas.duke.edu/superfund/map/. 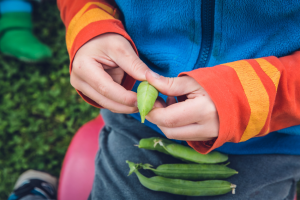 There are many health benefits to gardening, including connection to the outdoors and to other people, access to fresh food, neighborhood beautification, and so much more. 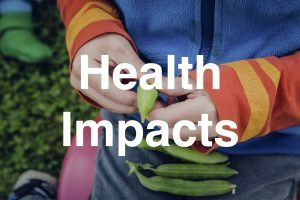 However, exposure to contaminants in garden soils – such as lead, arsenic, or pesticides—can negatively impact our health. In particular, soil contamination can affect the development of fetuses and young children. 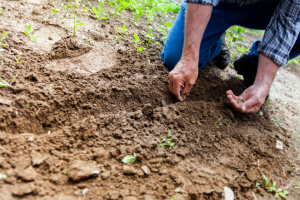 A soil contaminant is any substance found in a garden’s soil or used in gardening practices that is hazardous to human health. 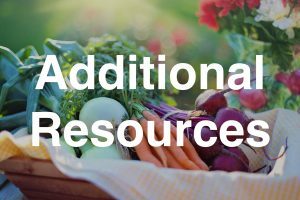 Some of the main contaminants of concern in North Carolina community gardens include lead, cadmium, mercury, arsenic, zinc, copper, polycyclic aromatic hydrocarbons (PAHs), and chromium. 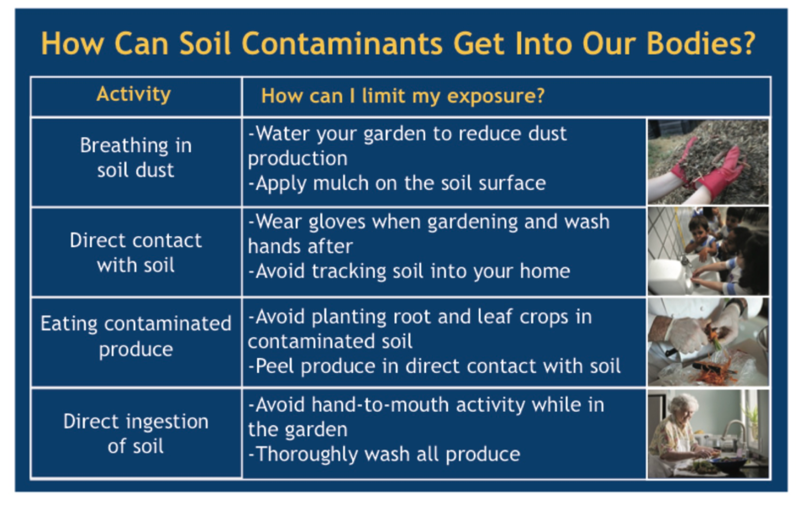 Soil contaminants can have a variety of health impacts, but due to the low exposure levels, we are most concerned about long-term effects that may take years to develop or contribute to long-term illnesses or impairments, especially with early life exposures. Do you want to know what is in your soil? 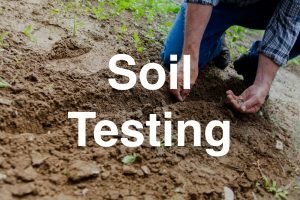 The state of North Carolina provides basic soil testing for acidity (pH) and nutrients. 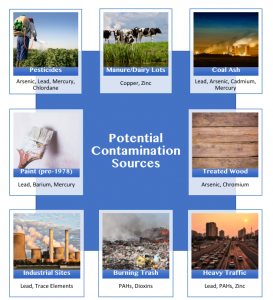 If you know that you are concerned about specific soil contaminants or pesticides, you may contact private laboratories throughout the state for testing services (see below). Contact the Superfund Center for more information about contaminant testing and possible group discounts at SuperfundCEC[at]duke.edu.